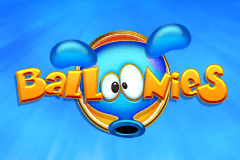 With a theme that can best be described as unique, and a fun, cartoon style, Balloonies is a great-looking pokie from the famous IGT company that rewards players with wild multipliers, free spins, bonus features and symbols that float away when they make up a winning line, allowing new ones to rise into their spaces for a potential second prize. Like all IGT games, it’s got reliable payouts, a good return to player ratio and smooth animations to go with the exciting gameplay. Symbols spin against a bright blue sky, with the occasional fluffy cloud floating around it, and although reels are not clearly defined, there’s 5 of them, with 3 rows and 20 paylines running across them. The balloon theme is fun, allows for some nice animations and gives IGT the chance to add a few balloon animals to the reels, making this a very appealing game for the young at heart. Balloon-shaped Q, K and A symbols make up the lower value wins, and any time 3, 4 or 5 of these, or the picture symbols, land across a line on sequential reels running left to right, players will get a prize. The picture symbols are what makes Balloonies such as visual treat, with balloon animals such as a giraffe, elephant, monkey and blue game logo paying out the bigger prizes in the normal run of play. Of course, as these are worth more, players will generally find that they turn up less often, but there should still be enough high value winning spins to stop bankrolls from becoming too deflated. Everything is accompanied by some simple animations, with symbols floating up from below, rather than spinning from above like most games, while each of them will bounce a little to add to the impression that they are balloons, plus the monkey blinks and so on. While it’s all very nice lining up symbols for a win, Balloonies has much more going for it than just pretty images and standard payouts. The fun starts with the symbols making up each winning combination becoming over-inflated and pop. This leaves empty spaces which get filled by any symbols below them or from underneath the reels, which can in turn create another winning line, which will also pop, repeating the process again. The frequency of wins should be boosted by the wild symbol which looks like an exploding red balloon. This little guy will act as all standard symbols if he can then complete a winning line, although he’s not actually worth anything on his own, so will need to be part of a line to have any value. The middle 3 reels can sometimes have a star symbol float up on to them, and when it happens on a winning spin, the value of the prize will be multiplied randomly by 2x, 3x or 5x. If 2 or more stars appear at once, the multipliers are combined for some potentially big wins from what would have been modest prizes without the stars. Another symbol that players will be pleased to see is the Bonus, which floats along on a pink balloon and is worth 40x the line bet. Any time 3 or more appear in any positions, a free spins round is triggered, but before they commence, players will be shown 3 colourful balloons and need to pop one of them to reveal how many spins will then play out. Between 4 and 14 spins will be awarded and although they can’t be re-triggered, there’s extra star symbols added to the reels which make it more likely that players will score some decent multipliers if they get a winning line during the extra games. This is a fun pokie that may look like a simple set of cartoons floating around the reels, but actually has some decent bonus features to enjoy. The one that players will see most often is the winning lines popping and new symbols floating up into their places, and while it’s not guaranteed that a second, third or more win will occur, it can happen quite frequently. The wild substitutions should help boost the frequency of winning spins, but it’s the star multipliers that can really make a prize into something special. Although it’s possible to get just a few free spins, should a winning line appear during them, there is still the second chance for another prize when the symbols pop, plus the extra star multipliers should result in a big payout. Most pokies have a few downsides, but Balloonies is one of those rare gems that has lots going for it and precious little to burst its reputation.